Bartek Ciszewski: What is the idea behind whym? Martin Key: People are aware of automatic translation using artificial intelligence. However, they also understand that, professional interpreters are needed when accuracy matters. Imagine an unexpected accident (car crash, sickness, arrest) happens while you are travelling in a foreign country. In such emergencies, a dictionary, phrase reference, or even a sophisticated automatic translation are not enough. On the contrary they can lead to further misunderstandings and make a bad situation even worse. This is where whym becomes useful. The application provides access to a live interpreter 24 hours a day, 7 days a week, anywhere in the world. Simply open the app, tap on the language required and you will be connected with an interpreter in less than a minute. 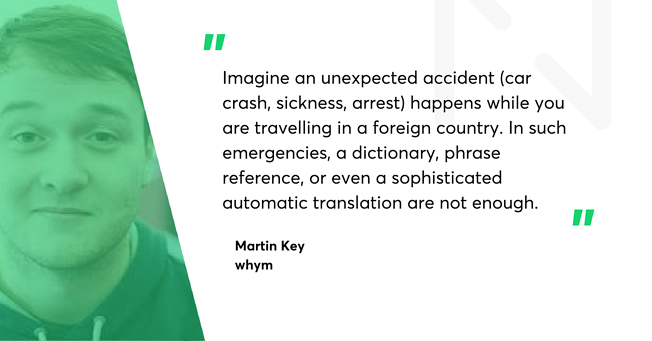 The idea for the whym app was born when looking for a new way to market the services provided on InterpretersPortal. We decided to focus on the customer market and travellers. To that end, developing a mobile app that would provide an intuitive interface for the portal's backend seemed as a natural solution. Martin: Our team is young and quite small. A lot of us had never worked in the mobile industry before. It was a big challenge to create our Minimally Viable Product (MVP). We did it before hiring Netguru. The app was very simple. For the next stage we needed the expertise of the Netguru team. The app we designed was fairly simple, and Netguru came up with more sophisticated features. When we were building the MVP, we did not work with designers per se, we knew what we wanted, and we tried to implement our vision on our own. That is why we came up with a basic set of UX features. At first whym started as a web based app. Later we developed a version for Android and iPhone. Another challenge for further development, was that our MVP was build from scratch by an individual developer. The main business challenge was to add and engage new groups of InterpretersPortal customers. Bartek: How did you come across Netguru? Martin: We are located in WeWork coworking offices in London. Your CEO was visiting it and got in contact with us just at the moment when we were looking for a developer to rewrite the application. We considered some other teams, but references, communication skills and transparency of project management at Netguru convinced us. Martin: The scoping session was very impressive. We could see your team was able to understand the goals for the product. We worked with a team of five people: two developers, a designer, a quality assurance specialist, and a project manager. When we needed to speed things up, we added a third developer to the project. The communication with the team was very good. Netguru knows how to make use of the collaboration tools, like Slack or Jira. I had access to all the design and development progress, as well as direct contact with every member of our Netguru team. I was especially impressed by the designer's work. He was able to expand our idea, and expand the few screens we had to the full coherent interfaces on both Android and iOS platforms. Bartek: Where's the project now? Martin: We have already launched the new version of the iOS app to AppStore and will later release an Android app. See also: Case study of the project on Behance.